Arthritis | Your Health. Your Lifestyle. Arthritis defies stereotypes. That’s because arthritis is not a singular, specific disease: There are more than 150 different types of arthritis in existence, affecting more than 50 million Americans and counting. Cases are expected to reach 67 million by 2030, according to the Centers for Disease Control and Prevention (CDC). Arthritis—a general term for conditions affecting the joints and surrounding tissues—is the most common cause of disability in the United States, limiting mobility for 21 million Americans. But thanks to advances in understanding and treating arthritis, many patients like are able to live full lives free of disabling pain. The range of arthritic conditions runs the gamut from common, well-known disorders such as gout to lesser-known conditions such as ankylosing spondylitis, a form of inflammatory arthritis that mostly affects the spine. Bursitis, tendonitis and carpal tunnel syndrome also fall under the arthritis umbrella. But osteoarthritis (OA) and rheumatoid arthritis (RA) are two of the most common and potentially debilitating forms. cartilage is worn down over time. Unlike other tissue in the body, cartilage can’t regrow, and when too much cartilage is lost, symptoms of osteoarthritis—pain, stiffness and swelling—can result. Symptoms generally appear after age 40, often in the hands, hips and knees. 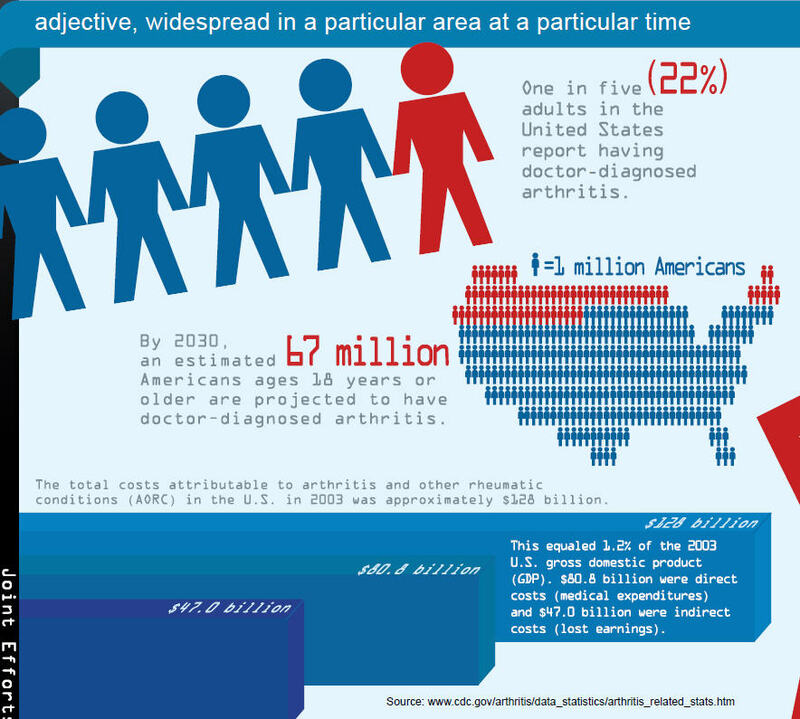 The most common type of arthritis, OA affects an estimated 27 million American adults. More than two-thirds of people will have degenerative joint changes by age 70. Today’s longer life spans and higher rates of obesity (a risk factor for OA) mean that stressed joints must perform longer, putting more people at risk, he says. “There’s no substitute for a complete family history and medical exam,” says Nathan Wei, M.D., clinical director of the Arthritis Treatment Center in Frederick, Maryland. In addition to a family history and a physical examination, a doctor may use laboratory tests, X-rays and MRI tests to determine the extent of joint damage. There’s no known cure for OA, though emerging research is paving the way for new treatments in which patients may be able to retain and even regrow cartilage in arthritic joints. But for now, common treatments include nonsteroidal anti-inflammatory pain relievers such as ibuprofen, combined with exercise and lifestyle modifications, such as weight loss to reduce joint strain. Once frowned upon for OA patients, exercise is now viewed as essential for successful treatment. “Exercise is as important as medication,” says Wei. 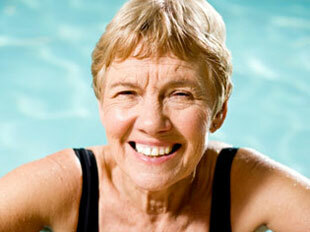 Low-impact forms of exercise such as swimming, resistance training and stretching are ideal. The CDC estimates that 1.5 million adults have RA, which is two to three times more common in women. While OA is generally discovered later in life, RA is often discovered earlier, says Wei. The 30s and 40s are prime years for diagnosis. There is no singular test for RA, so doctors use a combination of physical history and examination, blood tests and X-ray imaging to make a diagnosis. Thanks to emerging science concerning RA biomarkers— biological clues to the existence and extent of RA disease activity—sophisticated blood tests can now aid in the detection and management of RA, says Mease. As recently as the 1980s, RA patients routinely received gold injections as a primary form of treatment. Today, the gold standard for RA treatments is disease-modifying antirheumatic drugs and biological therapies—protein-based prescription medications that fight the abnormalities that cause RA. USANA PROCOSA® KEEPS YOUR JOINTS MOVING SO YOU CAN KEEP DOING THE THINGS YOU LOVE. Staying active is the key to lifelong vitality. Don’t let joint trouble slow you down. 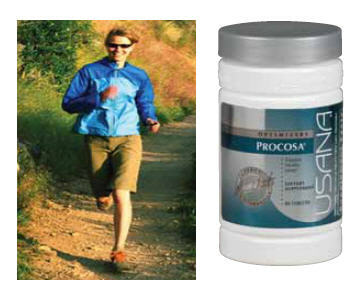 Procosa® is USANA’s groundbreaking supplement for joint health. And now, with a new formulation designed to give you even more joint health benefits, Procosa can help you keep the life in your lifestyle. Meriva has been shown to improve joint comfort and function and to support a normal, healthy inflammatory response. Traditionally, curcumin (from turmeric) tends to break down in the stomach and does not pass through cell walls efficiently, making it necessary to include large quantities in a product to deliver any real health benefits. Meriva enhances the action of Procosa by wrapping curcumin in a protective lipid barrier, keeping it from breaking down in the stomach and helping it pass through cell walls more easily. Glucosamine has been shown to provide the building blocks your body needs to naturally build and repair the components of healthy joints. The new vegetarian glucosamine HCl blended with joint-supporting minerals delivers the same great action as glucosamine sulfate with excellent purity and potency and without using shellfish. Think about what you did this morning. When you woke up, maybe you hit the snooze button a few times before getting out of bed and making your way—albeit groggily—to the bathroom. Maybe you took the time to make breakfast, or maybe you simply turned on the hot water and stepped into the shower. You washed your hair, your face, your body, and then toweled off and got dressed for the day in your favorite button-up shirt and those nice, classy slacks. To most people, this morning routine is done on autopilot. But to someone suffering from joint inflammation, commonly known as arthritis, this morning routine can be described as anything from slightly uncomfortable to downright agonizing. Arthritis, the symptoms of which include pain, stiffness, aching, and/or swelling of the joints, is the effect of years of wear and tear on our body’s joints. And with an estimated 50 million people suffering from doctor-diagnosed arthritis in the United States alone, it is the nation’s most common form of disability. Its limiting effects on a person’s mobility significantly reduce quality of life and the tasks a person can perform on a daily basis—even the simplest ones. But there is hope. By understanding the causes of arthritis, and by taking preventative action, we can help save our joints and live long, healthy, active lives. Family history: Genetics does seem to have an affect on whether a person develops osteoarthritis. Advancing age: The older you are, the more likely you are to develop joint pain. Obesity: Carrying additional weight on your frame puts you more at risk because you are putting extra strain on your knees and ankles. Overuse or injury: Those who put extra strain on their joints, such as competitive athletes or those whose jobs require repetitive motion, are at a higher risk of developing joint issues. A strong desire to move the legs while sitting or lying down — the urge can feel impossible to resist. Unpleasant sensations in the calves, thighs, feet (sometimes even the arms). These have been described as creeping, itching, pulling, tingling, burning, or tugging. Immediate relief after moving. Stretching, jiggling, or walking can help. Try heat or cold packs. Pain relievers, sleeping aids, or anticonvulsants may also help. Plus, 2 drugs for Parkinson’s disease have been FDA-approved for treatment of RLS. If you think you might have this condition, ask your doctor for more details.